In general, there are certain specifications which will make mouthpieces play a particular way (excluding the internal design), the following basic information is provided to assist in understanding that information. This is general information, it may not be specific to a specific mouthpiece as designs vary to overcome certain limitations, etc. FACINGS – a Table Facing is the length and shape of the “curve” that occurs from the table to the tip. The facings helps define the Tip Opening. In General, the shorter the facing curve the quicker the reed responds, therefore quick notes are easier to play. But, in general, lower tonal qualities are also affected and become not as sonorous as a Medium facing. Whereas, in general, a long facing has excellent low note tonal qualities but mouthpieces are slow to respond. Thus, in general, the best for most players is a medium facing. 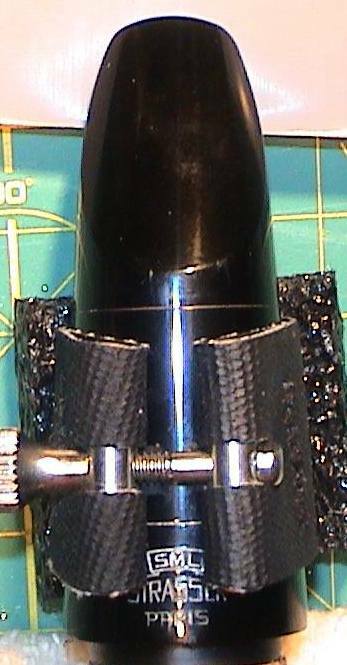 TIP OPENINGS – The Tip Opening is the amount of distance from the tip of the reed to the tip of the mouthpiece.In General, the larger the tip the softer the reed that is used. This is also dependent upon the Facing Length. Manufacturers will use a variety of combinations of long facings and large tips to short facings and large tips, or any variety to obtain a certain response and flexibility. Reeds also play an important factor. Embouchure – Why do I list the Embouchure in regards to mouthpieces?Basically, in order to obtain the “most” from a mouthpiece your embouchure has to take into account the Facing Length. If your embouchure does not then you are basically using a mouthpiece that is vastly different from what is is designed for. For example, if your embouchure lower lip was always at the 12mm mark then no matter the Facing Length you are going to close up the reed to the 12mm mark (or you will get air leaks after your embouchure) no matter if you are using a mouthpiece with a very long facing of 20mm or a short facing of 15 mm. This is basically shortening the Facing Length and Closing the Tip Opening because as you tighten your embouchure the reed is closing on the “curve” of the Facing Length and the tip opening is thus decreasing. So in essence you are “choking” the sound. Your embouchure would make most mouthpieces sound the same, and all instruments sound approximately the same. If you learn to vary your Embouchure (if you change mouthpieces), you will get the most from each individual mouthpiece and your tonal qualities per mouthpiece and instrument will vary more. For example, let us assume that in order to use the correct embouchure that your lower lip is 2 mm farther in than the length of the Facing Length. As you used shorter or longer Facing Length mouthpieces you have to be able to identify this. A quick test to determine a Facing Length is to use a piece of paper, or a playing card. Place this between the reed and the mouthpiece. Your lower lip should be placed about where paper stops. This is a good and quick guide on your embouchure lower lip location. If you have more than one mouthpiece try this test on them and see how they differ. Mouthpiece Pitches – What does the mouthpiece pitch have to do with anything ?A proper embouchure and reed strength will provide the proper pitch on a mouthpiece. Especially as you get up into the altissimmo register. Soprano Clarinet is Concert C ( D ) – The example below shows the relative pitch of the mpc and reed alone. You probably have read me mentioning that a soft reed plays flatter. But why, well, I think I found a nice explanation of that. In the preceding section we have ignored the compliance of the reed, discussed above. This acts in parallel with the bore, and its impedance decreases at high frequency, so its effect is to reduce the rise in impedance with frequency: softer reeds give lower overall impedance at high frequency. Further, the very high resonances are weaker and occur at lower frequency when you use a soft reed. On this figure, the single dots are the experimentally measured impedance spectrum for E3, with a value of the compliance corresponding to a hard reed. The continuous line (actually the experimental points joined together) shows the spectrum for a soft reed. At low frequencies, there is not much difference, but you can already see a slight difference in frequency: the hard reed plays sharper, all else equal. As you go to higher frequencies, you see that the soft reed gives lower peaks. Lower peaks are harder to play, so the hard reed makes it easier to play high notes. (Unfortunately, a hard reed also makes it easier to play squeaks. )To understand more about the detailed shape of these impedance curves, see the discussion of the experimental results for E3. in other words, a soft reed (of the same make and brand) play flatter. of course there are some things that can be done with mpcs to make them play sharper in certain ranges. Normally student mpcs are designed this way to accommodate softer reeds. Some professional mpcs also take on these attributes .. but like with anything else there is always give and take on other attributes. In observing clarinet players I have seen that many do not take in enough mouthpiece. This can greatly affect ones tone. The following is a quick guide of how much mouthpiece to take in and how to identify that “neutral zone” on any mouthpiece. Neutral Zone – this is the location on the mouthpiece where the reed goes away from the mouthpiece. 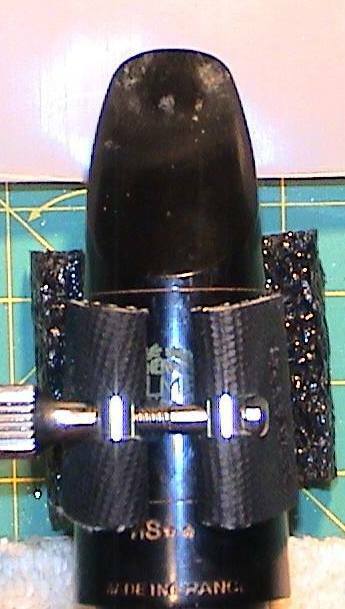 Each mouthpiece has a curve to it, which has to start somewhere. Anywhere before this Neutral Zone the player has to have a consistent embouchure to maintain stability. After this Zone the player can play without affecting the location the reed starts to vibrate. If we think about that a little more, If you lower lip is 1/2 inch closer to the top than the neutral zone then the reed has 1/2 inch less vibrating body. Also, if one pinches then this pushes the reed closer to the tip, normally closer than intended and thus the tone may be weak and insufficient. 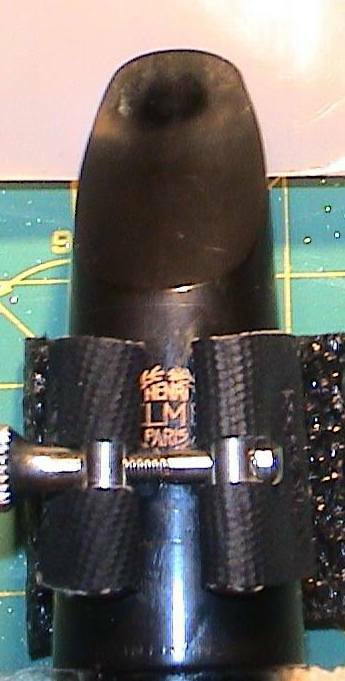 To identify the Neutral Zone first put the reed and ligature on. We recommend a “non-binding” ligature such as Rovners, or Vandoren Masters or Optima to allow the reed to vibrate freely in all registers. From left to right: vintage Woodwind K9, SML, vintage Selmer “table HS*”, Selmer HS**, Selmer C85-115 with their tip opening length (length from tip to the table where the reed is flat – on a non-vibrating reed. If we flipped the mpcs upside down the location of the paper (or in this case extremely thin teflon sheet) would be the ideal location for your lower lip, or slightly closer to the tip). But let’s keep in mind it’s not the location of you TOP teeth that identify your embouchure to the reed but your LOWER teeth. Two methods to accomplish this is one brings UP the lower jaw to the reed in which case the player will need to use more mpc into their mouth, or, which is the better case for the other muscles and the “proper” embouchure, to push the lower jaw out to meet the reed at the neutral point. You can read more about a Symphonic Embouchure by clicking here.